South Carolina had 14.1% percent of people living in households that were considered to be food insecure in 2011-2013, according to the U.S. Department of Agriculture’s (USDA) annual report released today. Close to 1 in 5 households lived in poverty during that same time. Each year, the Census Bureau measures food insecurity through a series of household survey questions about the ability to obtain enough food for an active, healthy life for all members. To report food insecurity in each state, USDA uses three-year averages to compensate for limited sample sizes and give a better estimate of the number of households experiencing hunger. It is even worse for the children of our state. More than 27% of our state’s children or 1 in 4 live in poverty the fifth highest in the nation. 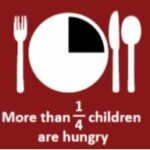 Among the 14.1% percent of South Carolina households considered to be food insecure, 5.1% percent were living in households that were considered to have “very low food security,” a USDA term that means one or more people in the household were hungry over the course of the year because they couldn’t afford enough food. 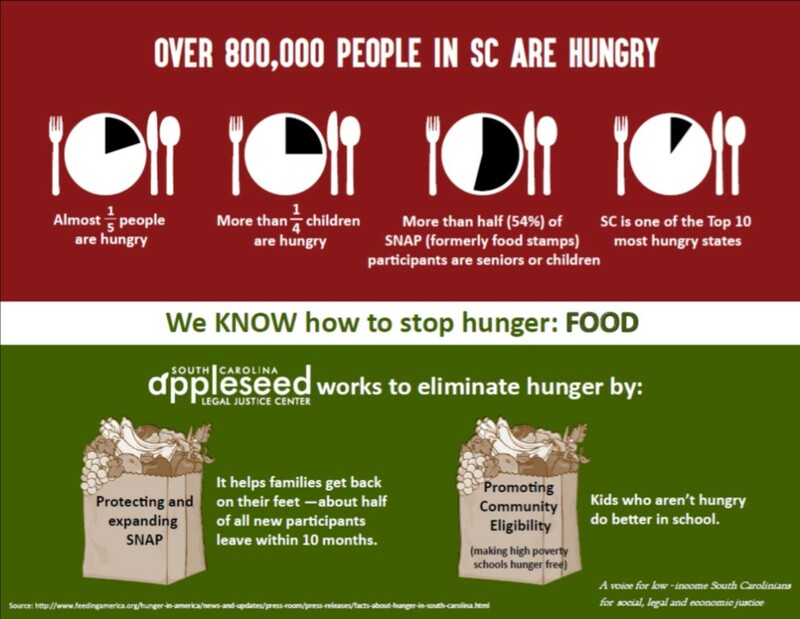 The State of South Carolina has worked has worked very hard to help increase SNAP participation and participation in the School nutrition programs, but clearly that is not enough. 86% of those eligible for SNAP are participating in the program, helping the tens of thousands of children and elderly access this number one defense against hunger. Our working poor also avail themselves of this very important program, with 84% of working poor accessing the program. It is simply unacceptable that, after years of economic growth, so many in our state face a constant struggle against hunger. We must work to increase participation in all programs that help feed our working poor, elderly and children. Programs that we know work – SNAP, Community Eligibility, Child and Adult Care Food Programs (CACFP). Until families are guaranteed the right to a living wage, we must work to strengthen these programs and ensure that all who are eligible participate.